The objectives of this report are to understand the Morris Avenue community’s transportation needs and to provide the City of Elizabeth with a Complete Streets Concept Plan that reflects these needs, putting into practice the City’s recently adopted Complete Streets resolution. Morris Avenue is a heavily used commercial corridor with direct access to the Elizabeth Midtown Train Station, but lacks some Complete Streets elements that would help improve safety and accessibility for road users of all ages – including pedestrians, bicyclists, and bus passengers, and freight operators. Key findings of this report show that residents are generally supportive of Complete Streets improvements, especially of pedestrian improvements such as wider sidewalks, more trees, bulbouts, and greater traffic enforcement (i.e., of speeding). However, residents, especially business owners, do not want on-street parking removed to accommodate these facilities. Future street design changes will therefore need to balance on-street parking with other road uses. Additionally, travel lane widths are wider than their use necessitate; this finding is reflected in recommendations for the narrowing of travel lanes that follow. 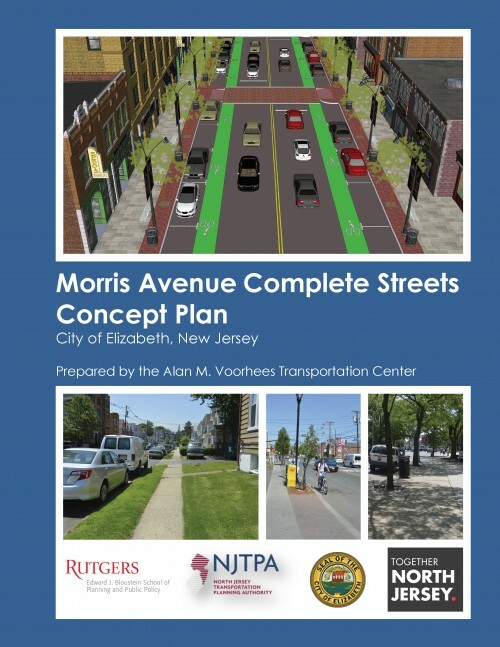 Using these and other findings, a Complete Streets Concept Plan was created that reflects the needs of the Morris Avenue community. The recommendations provided in the report would improve safety for all road users, especially the most vulnerable ones, such as pedestrians and bicyclists, bus passengers, the elderly, young children, and persons with disabilities. The importance of improving street conditions for these populations is supported by demographic data. Residents in the study area are poorer than those in Union County as a whole, with a median income of $45,463 compared to $75,235 in the county, suggesting that they rely more on nonautomobile forms of transportation. Additionally, nearly half of the residents (48%) spend more than 30 percent of their income on housing and so meet the federal definition of being “cost burdened” – leaving them less money with which to buy a car. The lack of access to automobiles is reflected in residents’ commuting patterns. Twenty-two percent do not have a vehicle available for commuting purposes, which is about twice that of Union County (12%). Many workers, therefore, commute by foot and public transportation: five percent and eleven percent respectively. With its multiple bus stops and direct access to the Elizabeth Midtown Train Station, adding Complete Streets improvements to Morris Avenue’s would benefit these commuters. Three design alternatives were then developed. Design Alternative #1 focuses on enforcing traffic laws, maintaining infrastructure, and beautifying the streetscape with elements such as street trees and pedestrian benches. Design Alternative #2 includes all changes in Design Alternative #1 and narrows travel lanes by adding bicycle lanes and shared lanes markers. Finally, Design Alternative #3 includes all changes in Design Alternative #1 and narrows travel lanes by widening sidewalks. It is recommended that Design Alternative #1 be implemented regardless of other changes made to the corridor. Funding for this project came from a TOGETHER North Jersey Local Government Capacity Grant, a program supported by the U.S. Department of Housing and Urban Development’s Sustainable Communities Regional Planning Grant Program. 13-county North Jersey Transportation Planning Authority (NJTPA) region.